Low impact automobile collisions tend to lead to very specific injuries, usually soft tissue strains. At higher speeds there are any number of traumatic injuries that might result. Among the possible traumatic injuries are broken ribs and resulting lung conditions. If you have sustained a traumatic chest injury, including fractured ribs, flail chest, a collapsed lung, a hemothorax, or a lung contusion, and the injury was due to someone else’s negligence, the Raleigh attorneys of Maginnis Law can help. We represent North Carolinians in personal injury disputes against insurance companies and other defendants. To speak with a chest injury attorney, call the firm at 919.526.0450, send us an email at info@maginnislaw.com or submit a new case inquiry through our contact page. Flail chest is dangerous because the flail segment can potentially puncture the lung. After the lung has been punctured, gas is released into the cavity that surrounds the lung. This gas can place pressure on the lung which can cause it to collapse. In medical terminology, a collapsed lung is referred to as pneumothorax. 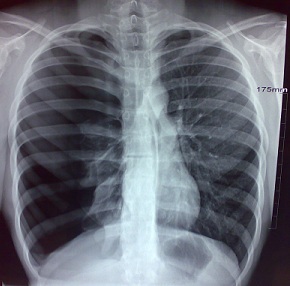 If both lungs are collapsed, the condition is caused bilateral pneumothoraces. Often times, a rib may only puncture one lung. As the gas compresses that lung, it may force it toward the other side of the body. This places pressure on the heart and the opposing lung. This life threatening condition is referred to as tension pneumothorax. Other common chest injuries include a hemothorax and pleural effusion. A hemothorax exists when there is blood inside the cavity that encloses the lung. This blood can contribute to tension pneumothorax. Many times, a chest tube is required to remove the blood. A ventilation mask or nasal cannula may be required to assist with breathing. While chest injuries can be life threatening, folks often times do fully recover. You may, however, be saddled with a massive medical bill. A hospitalization of a week, along with associated diagnostic testing, can sometimes run close to $100,000.00. If you have sustained such an injury, you are entitled to not only recover your medical expenses but also compensation for lost wages and physical and emotional pain and suffering. Other damages may also be available, depending upon the particular facts of your case. The Raleigh law firm of Maginnis Law represents personal injury claimants in a variety of serious accident cases. We offer free consultations and accept traumatic chest injury cases on a contingency basis, meaning you owe no attorneys’ fee unless we win or settle your case. If you are unable to travel due to your injury, a chest injury attorney will travel to meet with you. To speak with a Raleigh chest injury attorney regarding your case, or that of a close family member, please call 919.526.0450. Our firm handles cases involving fractured ribs, lung injuries, and other chest conditions throughout the state of North Carolina, including Raleigh, Durham, Chapel Hill, Cary, Fayetteville, Greensboro, Winston-Salem, Charlotte, and Greenville.